Entertaining Science has since 2002 paired public lectures by prominent scientists with performances by artists who address the lecture’s theme. One can expect anything: readings, music, theatre, magic, resolution of controversial issues. The general goal is to play with ideas, to talk to people about science, to entertain. And have fun. The series runs at 6pm on the first Sunday of each month, and is coordinated by founder, chemist and poet Roald Hoffmann of Cornell University with neuroscientist and composer Dave Soldier (aka Dave Sulzer) of Columbia University. Past participants include scientists from a broad range of fields, including Oliver Sacks, Benoit Mandelbrot, Joseph Le Doux, Carl Djerassi, Paul Greengard, Roger Payne and Mark Moffet, paired with the likes of downtown musicians, actors, filmmakers, playwrights, choreographers and flamenco dancers, bluegrass bands, and,photographers including Vitaly Komar, Elliott Sharp, Phoebe Legere, Mark Mitton and NelidaTirado. All inquiries can be directed to Monsieur Dave Soldier. 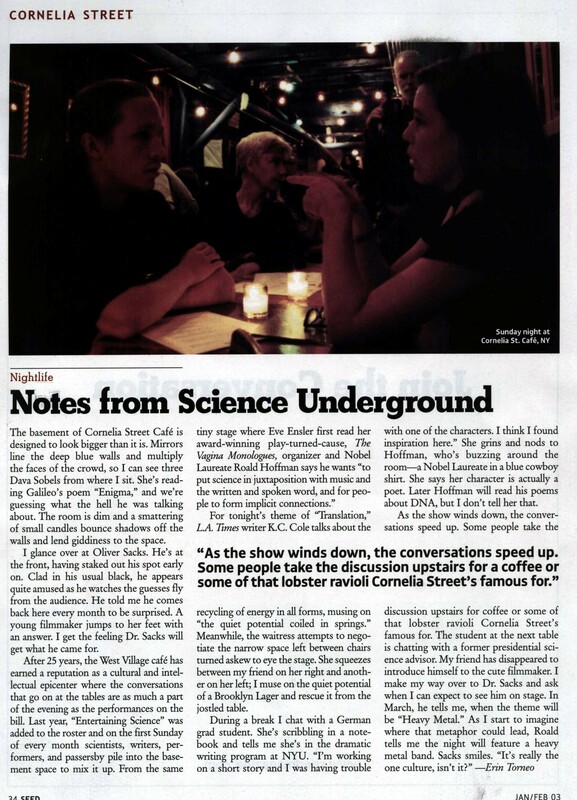 Links to Entertaining Science shows will redirect to the Performances page of the Cornelia Street Café website.